Below is a statement from the lawyer of a corp member who was accused of stealing a mobile phone which led to her humiliation with the incident recorded and gone viral. Read the statement and find screenshots below. We are Solicitors to Miss Jojo (hereinafter referred to as ‘Our Client’) on whose instructions and behalf we issue this statement. We are aware that some individuals have erroneously labelled our client “a thief’ out of sheer ignorance or heightened sense of malice as a result of the incident that occurred on June 6, 2018. This is of course, due to the lack of a full grasp of the true story leading up to the incident. Thus, for the avoidance of doubt, and to make right her precious image, we deem it expedient to make a statement, on the true facts of what transpired. These facts are hereby set out forthwith seriatim. On March 23, 2018, our Client entered a contract for the supply of clothes with one Mr. Fumbi Kuponiyi (trading under the name and style of Fame Wears) who persistently refused and/or willfully neglected to discharge his obligations under the terms of the contract, upon payment of the sum of #40,000.00 ( forty thousand naira only) by our Client. We have attached below, a screenshot of our Client’s conversation with Fumbi acknowledging the debt of #40, 000.00 to our client. 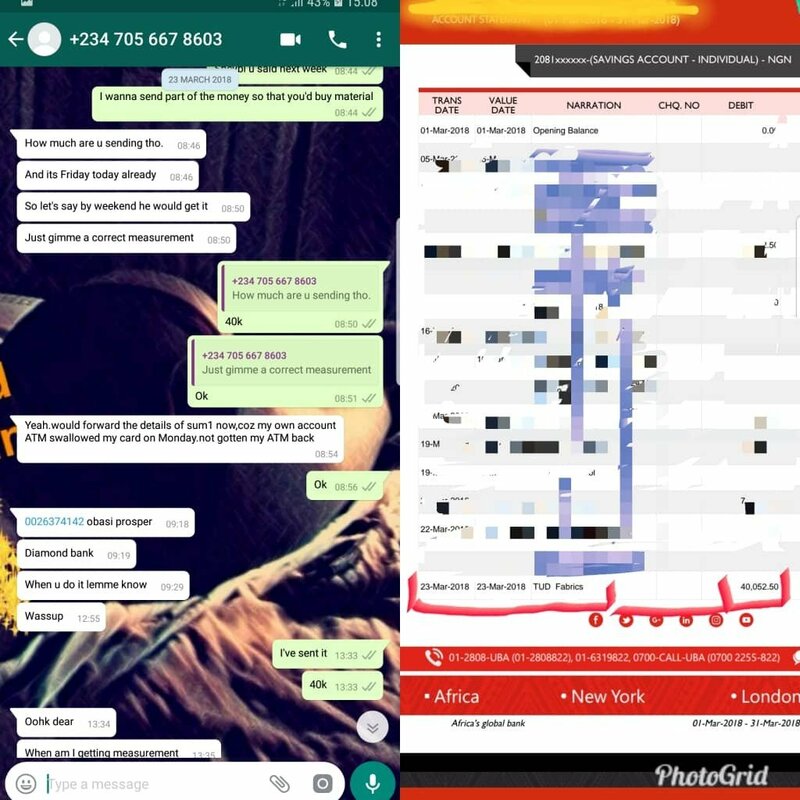 Upon series of futile attempts to recover her money, which saw the said Fumbi ignoring her calls and messages, our Client was able to set up a meeting with him at the Ikeja City Mall on April 27, 2018 where upon verbal confrontation, an iPhone 6s was forcefully collected from Fumbi as collateral for the unliquidated debt albeit not without him making fuss about it in public. In a rather shocking period that followed, Fumbi neither called nor attempted to recover ‘his iphone 6s’, especially as he had earlier strongly resisted the use of the said phone as a collateral. Our client reached out and informed him, to come and retrieve the phone. (a screenshot of this conversation is attached below) but Fumbi remained unperturbed. It then became clear that something was amiss. Our client then thoughtfully, reasoned that the only basis for Fumbi’s nonchalance was perhaps, because the phone did not belong to him. However, there was a problem, the screen of the phone was damaged and the owner of the said phone could not be ascertained. To cure this anomaly, our Client demonstrated an extraordinary act of kindness by repairing the screen of the phone for the sum of #30,000.00 (the invoice from the repairer with the said amount is attached below). After repairs it was discovered that the phone had icloud protection and the repairer suggested that the owner might be contacted using contacts from the sim card found during repair if inserted into another iphone. had no intention of punishing her for Fumbi’s actions. The owner thanked her for her kind gestures and both parties eventually agreed that Miss Judith would liquidate the sum of #30,000.00 used in fixing her phone, and on the suggestion of our Client, that she will liquidate an additional debt of #20,000 (adding up to #50,000.00) owing to the fact, that once the phone is gone, her #40,000.00 debt owed her by Fumbi will be lost. Miss Judith saw reason with this, and agreed. (We have begun the process of retrieving the telephone communication between our client and the said owner which would be made available to the public to buttress this point). 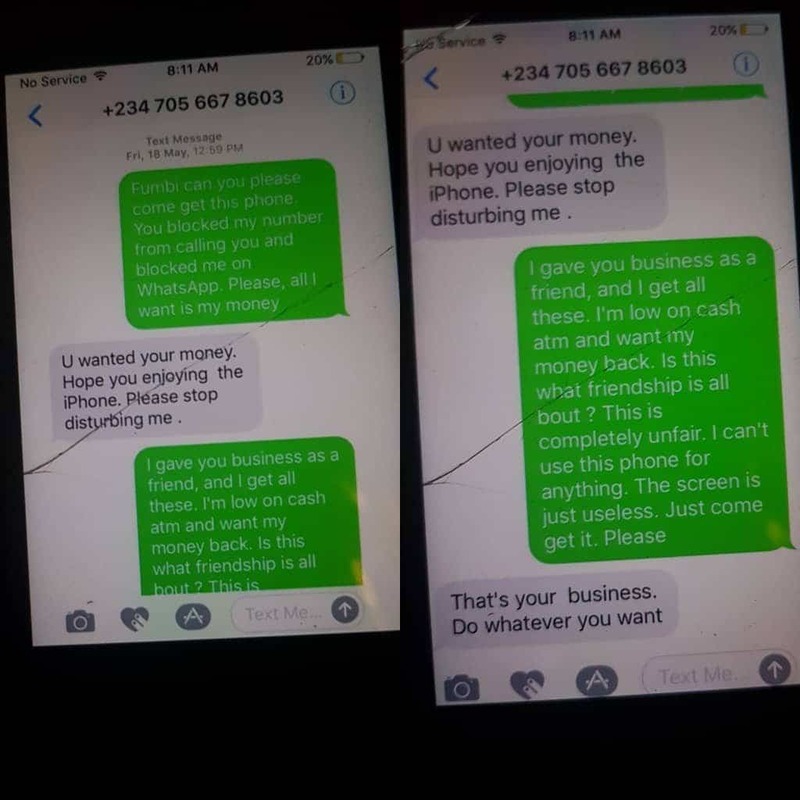 We make bold to say, that our client had at no time demanded for any ransom from the owner (this would be hilarious as she never kidnapped any phone nor had interest in keeping a phone that was not hers), all she wanted was predominantly the #30,000.00 expended on the phone to ascertain its true owner. (We have attached a video dated June 5, 2018 sent to the owner calling on her to come and retrieve her phone, and just bring her money, her loss was becoming too much). The parties agreed to meet at Circle Mall, Lekki. However, the owner of the Phone came with a Police officer to arrest our client as the “thief” of her stolen phone. Fumbi. Our client was painfully and unfortunately detained at the Ilasan Police station, Lekki Jakande without legal representation. The police refused to hear or investigate her story. She was eventually granted bail at 8p.m in the tune of #80,000.00 (eighty thousand naira only) and her iphone was seized till full payment was made the next day. We must categorically state, that our client was charged to court, but all allegations against our client were struck out by the learned trial Judge who demanded our client to be more careful with her business partners (in reference to Fumbi Kuponiyi) in future by signing an undertaking to that effect. (A copy of this ruling is accessible to any member of the public who so desire to have it). We wish to state that up till this day, the 30,000.00 used in fixing her phone, and on the suggestion of our Client, that she will liquidate an additional debt of #20,000 (adding up to #50,000.00) owing to the fact, that once the phone is gone, her #40,000.00 debt owed her by Fumbi will be lost. Miss Judith saw reason with this, and agreed. (We have begun the process of retrieving the telephone communication between our client and the said owner which would be made available to the public to buttress this point). We make bold to say, that our client had at no time demanded for any ransom from the owner (this would be hilarious as she never kidnapped any phone nor had interest in keeping a phone that was not hers), all she wanted was predominantly the #30,000.00 expended on the phone to ascertain its true owner. (We have attached a video dated June 5, 2018 sent to the owner calling on her to come and retrieve her phone, and just bring her money, her loss was becoming too much). The parties agreed to meet at Circle Mall, Lekki. However, the owner of the Phone came with a Police officer to arrest our client as the “thief” of her stolen phone. Our client explained her story to the police, who neglected, refused and failed to investigate or inquire about the said Fumbi. Our client was painfully and unfortunately detained at the Ilasan Police station, Lekki Jakande without legal representation. The police refused to hear or investigate her story. 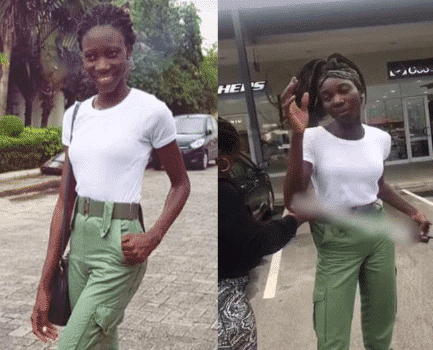 She was eventually granted bail at 8p.m in the tune of #80,000.00 (eighty thousand naira only) and her iphone was seized till full payment was made the next day. We must categorically state, that our client was charged to court, but all allegations against our client were struck out by the learned trial Judge who demanded our client to be more careful with her business partners (in reference to Fumbi Kuponiyi) in future by signing an undertaking to that effect. (A copy of this ruling is accessible to any member of the public who so desire to have it). We wish to state that up till this day, the #30,000.00 expended on the phone by our client has not been paid to her, irrespective of the fact that the owner acknowledged that the screen of the phone was faulty even when she had it. I. True, the phone had icloud protection, is it not possible for it to be sold in the ‘black market’ at whatever value possible? Why go through the hassle of getting to the owner if our client had a guilty mens rea? II. Why did the police not investigate the said Fumbi or at least bring him in for questioning? (We have attached a conversation between Fumbi and our Client on June 8 immediately after becoming aware of the ‘theft’ story propagated on social media). We leave these questions for the public to answer without the clouding effect of sentiments. We humbly entreat ALL bodies or individuals promoting defamatory content against our client to kindly desist and remove ALL defamatory content forthwith. Failure to do so, we will be forced to seek redress via litigation and its antecedent consequences.